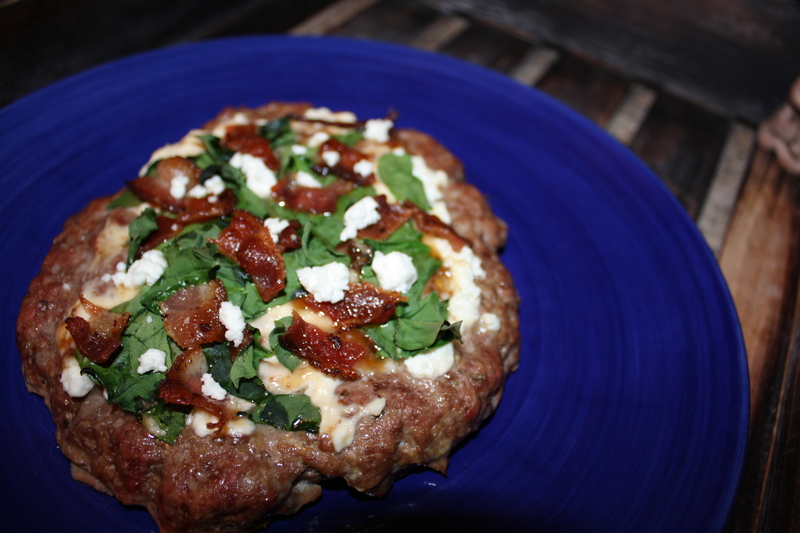 Alright people, I’ve been wanting to make a Meatza for quite some time now. Ever since I saw a recipe for it in Diane Sanfilippo’s 21 day sugar detox book back in January! The best part of meatza pizzas is you can make them individual size meaning whatever toppings your little heart desires. No compromising with the picky other half on this one! Preheat oven to 400 degrees. Put all of your ingredients for your crust into a bowl and mix together. Once seasonings are incorporated in to meat, form two giant meat balls. Take each one and place it on a baking sheet lined with parchment paper. Flatten out the balls so they start to form a pizza pie shape. I flattened mine until it was about a half inch thick. Cook for 15 minutes. While the crusts are cooking cool your bacon on the stove in a skillet. After 15 minutes take the pies out of the oven and start to plant your toppings. 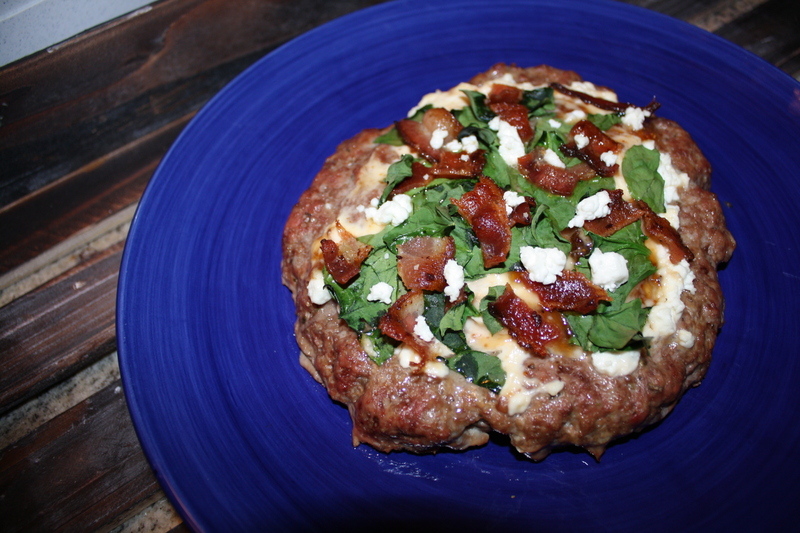 For toppings 1 I started with goat cheese then added the fig spread before sprinkling the spinach and bacon. For toppings two just start with the tomato paste of course. Place the pies back in the oven for 5 minutes. For a little added crisp or melt place them under the broiler for 2 minutes. Wah lah! Anyone have any good topping creations for a Meatza? Does a Meatza pizza scare you? My sister-in-law makes meatza every now and then. I haven’t attempted it yet, mostly because I’m too lazy. I just throw it all in a pan and cook it up! It was a lot easier than it looks!